There is nothing better than being in the middle of Paris, where everything Parisian is within your easy reach. 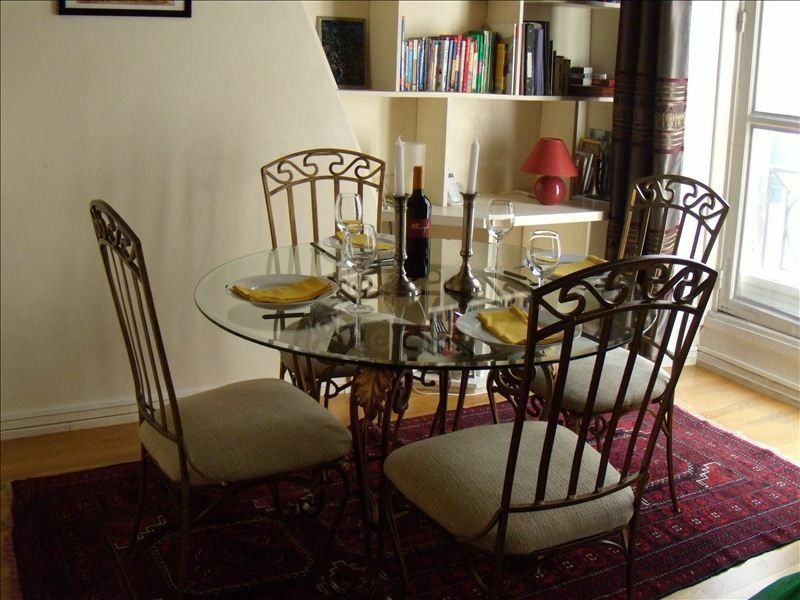 Your lovely apartment is situated on the Left Bank, just opposite Notre Dame Cathedral. This 17th century building is located in the oldest section of Paris, full of history at every turn. Your apartment is conveniently located just steps away from Station St. Michel, which serves the Metro line 4 as well as the larger RER lines B and C.
Just imagine coming back to your quiet hideaway after a long day of sightseeing; and having time to put your feet up. After a bit of relaxation and a couple of glasses of French Wine, it is just an easy stroll to dinner. Your centrally located home-away-from-home makes this all possible. At your Paris apartment, you are within walking distance of Notre Dame Cathedral, Hotel de Ville, Le Marais, Place de Vosges, Pompidou Center, Ile St. Louis, St. Michel, Jardin de Plants, Le Sorbonne, St. Germain, Sainte Chapelle, Latin Quarter, etc. Your 1st floor apartment (2nd floor, by American system) with large windows was historically considered as the ''noble'' floor. When you open your front door, the entry hallway invites you to the living/dining room. The apartment's high ceilings still contain the original wooden beams, which is part of the charm/history of the building and the area. It also provides the perfect setting for the large woven tapestry on the wall behind the sofa. The convertible sofa was especially selected for the excellent firm mattress providing a comfortable sleep. The dining area is composed of table that will seat 6 comfortably. The large built in bookshelves hold a good selection of reading material, including maps and tourist information. The apartment has two large windows that open to enjoy the pedestrian only street below (rue de la Huchette) that is filled with interesting shops, boutiques, and restaurants. Your kitchen is equipped with everything necessary for a simple breakfast, afternoon tea, cocktails & hors d'oeuvres (or amuse-bouche), or something more substantial. This includes refrigerator, cook top, microwave, toaster oven, electric coffee maker, dishwasher, and a German combination washer/dryer. The bedroom has a double bed and plenty of storage. There is also a small folded IKEA cot that is ideal for a small child. The bathroom has a bathtub/shower, hair dryer, etc. All bed and bath linens are included. Paris usually has fairly mild weather but just in case of a summer heat wave there is an air conditioner for the bedroom and also a portable fan in the living room, all for your comfort. What you will get from us: We will work with you to provide answers to all your questions before you leave home, and will provide detailed instructions for getting to the apartment, regardless of your mode of transportation. We will offer to book a car service for you, which will streamline the arrival/departure process. We will be there to greet you, help with your luggage, and provide an informative tour of the apartment, explaining how everything works. We will give you a brief introduction to your new neighborhood so you can find all the important things, and can also give recommendations for our favorite bistros, brasseries, cafes, and restaurants, and help make reservations as appropriate. We are only a telephone call away, should you need help, while in our care. Our mission is to give you the best experience possible, which will make your dream trip even more memorable. We wanted to be right in the heart of Paris. This location coudn't be better. An air conditioner is provided for the bedroom. This will not cool the entire apartment. Comfortable sleeper sofa and chair together with large dining table. Table can sit up to six. Cable including CNN, BBC, Sky, CNBC, Bloomberg, France 24 (in English, French, or Arab), Al Jazerra (in English, French or Arab), etc. An assortment of guide books, etc. I had a great 8 day stay at this apartment. It truly felt like a home away from home. Great location and most importantly for me a cafe less than a half a block away that opens at 6am. Fabulous property, well taken care of in an old building. We were so amazed at the location we over looked the noise from outside. I’d only suggest, ‘Blackout’ curtains in the living room...there’s a lot of street light. Loved our welcome gift and meeting the owner. This location is smack in the middle of everything. You are literally steps from so many beautiful sights. To step right out into the bustling streets of Paris is breathtaking and to see all the incredible sights and hear the bells of Notre-Dame ! This property is exactly as pictured. Has the historic charm. With high ceilings and beautiful wood beams ! The flat is perfectly equip to make your stay pleasant . The service and assistance provided by, David Sprawls, was far above and beyond. He is attentive , witty, and just added so much to our overall trip. Thank you David for being there every step of the way . You are greatly appreciated. And we look forward to our return one day. David was great providing everything we required. There is a little noise from the streets but closing the windows and bedroom door took care of that. Location is great and we used the metro everyday to get around Paris. Excellent security for the building and residents. In the shadows of Notee Dame, the flat was quite charming. Close to the Metro and RER stops, it allowed us to easily explore Paris! Next to all the night life so you get all the sounds and sights of the area. Casually stroll through the neighborhood and explore all the shops. We really enjoyed being so close to the Cité! Walking all over or taking the Métro from so close was great ... The apartment was lovely, and the bed was very comfortable for tired bodies after a day of sightseeing. Thanks! Please visit our other VRBO-listed properties: 582600, 603835, 647010, 670590, 790263, 790259, and 512083, as well as those shown in the link for ‘All My Rental Listings’, below, just under the map.